Computer experts Rich Stompanato, president of ARDS Services, and Sun Kwok, president of Integral Corp., started a new program in which they refurbish old Naperville Unit District 203 computers and give them to kids in need. For some students in Naperville, having a computer in their home isn't a given. Typing a research paper or filling out online college applications requires coordinating a trip to the library, or spending hours after school. But area computer experts want to make sure low-income students have the same access to their own computers as their peers. 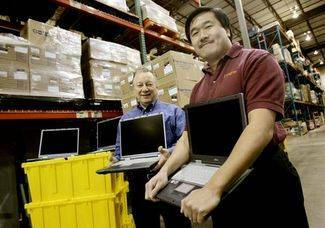 Naperville's Sun Kwok and Richard Stompanato, members of the Naperville Technology Group, are spearheading a Computer Redeployment Project in Naperville Unit District 203 that gives refurbished laptops to students in need. "If you want to be competitive in a global economy you have to take steps necessary and give them technology," said Kwok, president of Integral Corp. He and Stompanato, president of ARDS Services, are active not only in the Naperville Technology Group but also the Rotary Club of Naperville and Naperville Area Chamber of Commerce and wanted to use their expertise to give back to the community. Naperville Unit District 203 had about 700 computers it was ready to retire and sell to liquidators. Instead, the Naperville Education Foundation purchased them and Kwok and Stompanato spent many long hours working out issues of licensing, how to wipe the computers clean of district information and making sure they documented every move. With the help of Naperville Central business teacher Peter Catalano and about 15 students, the group refurbished about 500 of the computers. This fall, the Naperville Technology Group gave out roughly 150 computers to District 203 students who had been recommended by their teachers and wrote short essays describing how they would benefit. "The reaction of the students was just overwhelming," Stompanato said. "To be there in that room when they were giving out computers to those kids and see their faces ... when I think about all the work, all the hours we put in and the frustration because it's a new program ... it was well worth it." To keep the program going in future years, they sold another 325 refurbished computers to community members for $250 each. The group is hoping either Comcast or AT&T will agree to partner with them to provide Internet access to students receiving the free computers. They also would like to not only continue the program in District 203 but expand it to Indian Prairie Unit District 204. Nina Menis, director of community relations for District 203, said she was struck by how many hours the two spent on the program. "It really adds that little margin of excellence in our programs," she said. "We're the school district we are today because of the business partnerships we've had and the community partners we've had and it's exciting to see that support from the community." Stompanato and Kwok said the program wouldn't have been possible without the support of the district as well as John Puscheck, president of Prager Moving and Storage who donated the use of his facility for housing the computers and Wes Ague, a consultant for JW Tech and Associates who is part of the Naperville Technology Group.